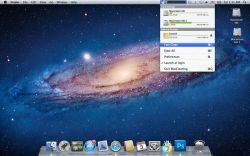 Een schone en gezonde Mac met één klik met MacCleaning Pro. 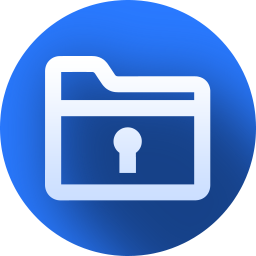 MacCleaning Pro (ook bekend als CleanGenius Pro in de Mac App Store) is een krachtige en handige menubalk utilitie voor het monitoren van je vrije harde schijfruimte, opschonen van overbodige bestanden en snelle toegang en ontkoppelen van volumes, daarmee je Mac systeem sneller makend en beter presterend. Met features als het ontkoppelen van alle gemounte schijven met één klik en het waarschuwen bij een bepaalde hoeveelheid beschikbare vrije ruimte van MacCleaning Free, biedt MacCleaning Pro nauwkeuriger, efficiëntere en veiliger onderhoud van je Mac. Deze professionele disk monitor en systeem opschoontool help gebruikers bij het werken op de Mac. Painless download and easy install on Mac. Appears on top bar with help accessible through ‘about’ on the top left, linking to a full online manual. However although the online manual seems to have links to chapters these don’t appear to work. 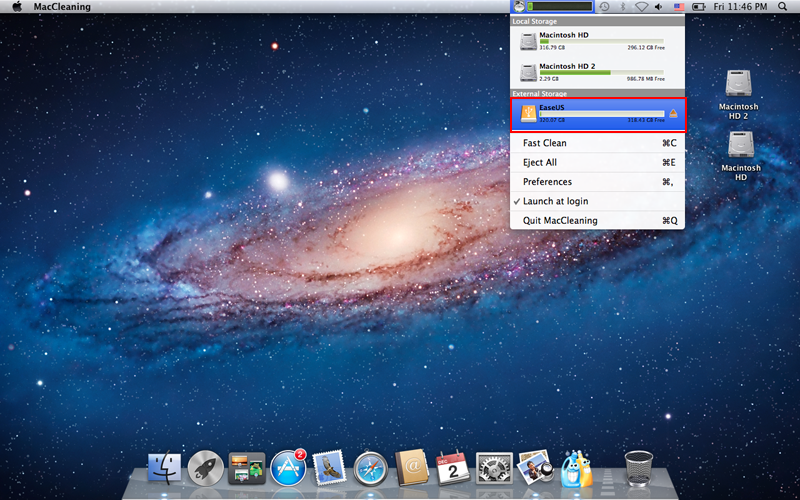 This was particularly annoying in trying to find out what ‘fast clean’ actually did. As mentioned above this utility is also available in the App store for 69p and is also half price on their website. No indication of registration. It’s useful to have a readily available visual display showing free space and a quick way of opening any drive. This extends to network and USB sticks, thus skipping right click ‘info’ tab for each device. My only concern rests with the dialogue box that quite rightly requests system password permission to make changes when I click ‘fast clean’. Despite clicking ‘cancel’ a whole succession of files appear to undergo deleting before repeated requests for permission. This would seem to be confirmed by a pop-up dialogue box. As with any software of this type it is advisable to ensure that your back up is working. Not altogether sure why there are so many negative votes. It would really help if they could be supported by comments for three reasons. 1. Mac users don’t find very much on GOTD so lets encourage more software by providing constructive feedback. 2. Have they found a really negative aspect of this software that we should all be warned about? 3. Are these votes really lost windows users? It’s good to see an offer for Mac users so thanks for this GOTD. I look forward to reading feedback from others during the day. 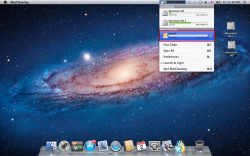 Painless download and easy install on Mac. Appears on top bar with help accessible through ‘about’ on the top left, linking to a full online manual. However although the online manual seems to have links to chapters these don’t appear to work. This was particularly annoying in trying to find out what ‘fast clean’ actually did. As mentioned above this utility is also available in the App store for 69p and is also half price on their website. No indication of registration. It’s useful to have a readily available visual display showing free space and a quick way of opening any drive. This extends to network and USB sticks, thus skipping right click ‘info’ tab for each device. <strong>My only concern rests with the dialogue box that quite rightly requests system password permission to make changes when I click ‘fast clean’. Despite clicking ‘cancel’ a whole succession of files appear to undergo deleting before repeated requests for permission. This would seem to be confirmed by a pop-up dialogue box. As with any software of this type it is advisable to ensure that your back up is working. </strong> Not altogether sure why there are so many negative votes. It would really help if they could be supported by comments for three reasons. 1. Mac users don’t find very much on GOTD so lets encourage more software by providing constructive feedback. 2. Have they found a really negative aspect of this software that we should all be warned about? 3. Are these votes really lost windows users? It’s good to see an offer for Mac users so thanks for this GOTD. I look forward to reading feedback from others during the day. There is no support for G4 processors for the same reason that there is no support for Windows 95 and NT on most current Windows software. If you insist on using legacy hardware or software, you have to expect that a lot of stuff will no longer work, especially utilities such as this one. Whining about it and calling it "hate" is just silly. There is no support for G4 processors for the same reason that there is no support for Windows 95 and NT on most current Windows software. If you insist on using legacy hardware or software, you have to expect that a lot of stuff will no longer work, especially utilities such as this one. Whining about it and calling it "hate" is just silly. Agree with comments - why so many negative votes. I am always using and heartily recommend products from Easeus. In this case, the program is not a complex one, so the price (when not a freebie from GAOTD) is probably in line with what Mac devs charge (I wouldn't pay more than $4.99, though, if this were a Windows offering). But it does what it says it will do and isn't intrusive in any way.